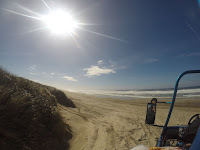 Today's activity was a tour of the Oregon Dunes on a Sandland Adventures large buggy. 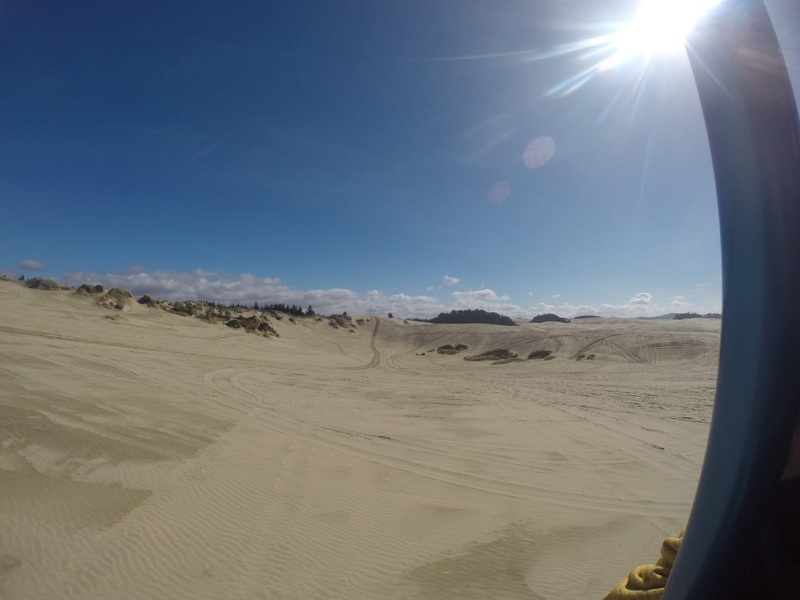 They also offer sandrail tours that are much faster but since they seat far fewer people, the cost per person was much higher. With this large of a vehicle, they weren't going to be ripping up and down the dunes. I believe that there were 16 people plus the driver on our tour. We made our way out to the ocean with narration for most of the way. He pointed out that on high tide, storm surges reach the line of vegetation. He also mentioned that the grasses that were introduced many years ago as a method of stabilizing the dunes were taking over. 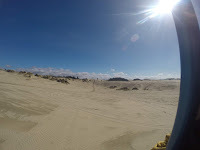 And soon they would cover the entire Oregon Dunes. The ride was fairly relaxing. These pictures were taken with my GoPro 3+. Of course, the batteries were all dead and the hour I had them charging was good for some video. The GoPro Studio app doesn't seem to be very compatible with the current Apple OS, Mohave. The replacement for GoPro studio requires Internet access to run which makes it kind of worthless, in my opinion. I may try messing around with iMovie again but I wasn't very happy with earlier results. Anyway, I included a short clip at with this post. After the sand tour, we headed into town and walked around the Old Town area. There was a wine tasting event going on where you purchase a wine glass for $5 and tickets for $1 each. By mid-afternoon, there were quite a number of people staggering around the area. Maybe $1 per glass was a bit too inexpensive. Tomorrow, the event switches to chowder tasting. But, it was a nice and sunny afternoon. Perfect for walking around Old Town. Parking was a challenge, much more with the truck than when we were here last time. The Ural fits almost anywhere. Most of the stores were either art galleries or bars/restaurants. I was tempted by the fish and chips but decided that I really don't need the calories. I even talked myself out of a cup of coffee. After walking through town, we headed back to the campground. All is quiet here. After dinner, we went back to Florence to watch the sunset over the river. I did a time-lapse on the iPhone but now I just need to figure out how to get it into the laptop and YouTube. Driving through sand dunes has been banned in many parts of Europe due to preservation of nature. I believe there might be a few spots in Denmark and France where you can still do it. However, it looks like so much fun. There were a number of designated camp sites out on the dunes. Vehicles out there were mostly quads and side by sides. A handful of motorcycles and very rarely, something bigger. I wonder how a Ural's narrow wheels would do on those sand dunes? My guess is that they'd dig down and then you're stuck. With neither speed nor flotation, I don’t think a Ural would do well at all.